Pitcairnea ( pit-kair-nee-ahh ) are perhaps the least evolved of all of the Bromeliads and closely resemble the grasses that they evolved from. They were named after Dr. William Pitcairn, an English physician and gardener. 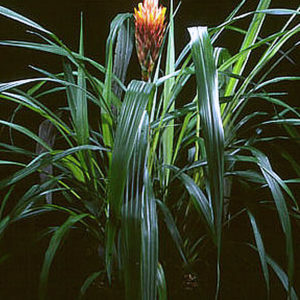 The genus Pitcairnia are the second most prolific group in the bromeliad family. They are mostly found in Colombia, Peru and Brazil but small pockets of them can be found in Cuba, south of Mexico to Argentina. Botanical Archetype – POSITION ( Relocation, Advantage ). Nature of Issue – IMPOSITION ( Dislocation, Disadvantage ). Always behind and never able to catch up, no matter how hard you try. Starting new things in an awkward or uncomfortable position. Primary Emotion / Emotional Symptom – DISADVANTAGE / IMPOSED UPON. + Advantage, Favourable, Well Placed, Opportune, Timely. – Disadvantage, Unfavourable, Out-of-Position, Imposed Upon, Imposition. Lesson – You are always well placed in life. You begin every creative expression in a favourable position. Picairnea help you to pick up from where you are and ‘plant yourself’ in a lifestyle that works best for you. Pitcairnea offer a way of relocating to a better position in life that is based upon spiritual truth. Rather than trying to establish one on the shaky ground of the surface mind. Pitcairnea combine well with Genus Puya and Cryptanthus. 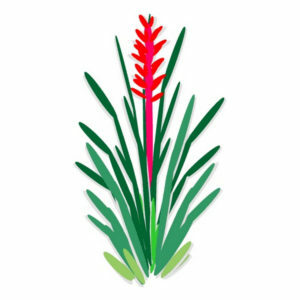 This is the botanical symbol for genus Pitcairnea. It is found in all of our books, clinical manuals, flower notes and charts.